If you are your brand, Profile Lite is for you. It’s a free WordPress theme for public speakers, personal trainers, entertainers, freelancers, and other professionals. We launched another free theme within the WordPress.org theme directory. 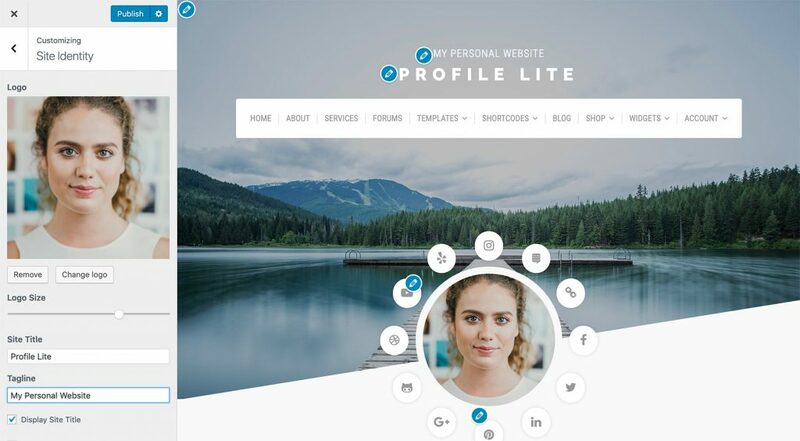 The Profile Lite theme is designed a to be professional representation of yourself online. It features a modern and responsive design, social media options, and works seamlessly with the WordPress 5 Gutenberg content editor. Additionally, Profile Lite is designed to work with Organic Builder Widgets for creating dynamic pages. 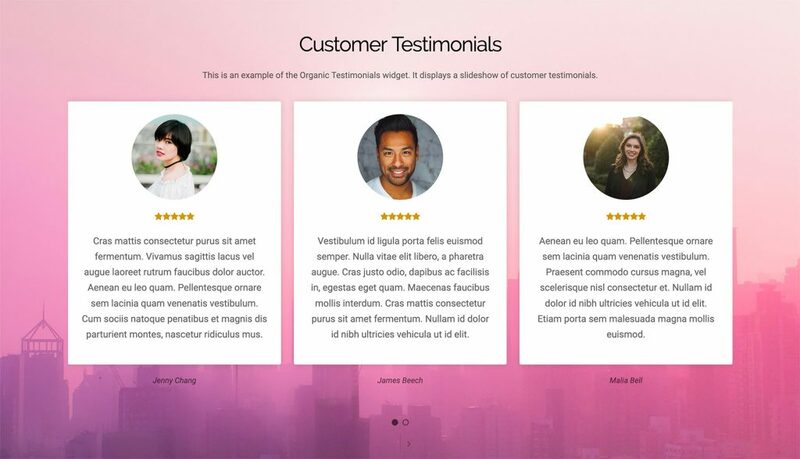 As a result, you can display client testimonials, slideshows, products, and more using our popular builder plugin. Getting started with the Profile Lite theme is fast and easy. All options are located within the WordPress Customizer. So, you can view your changes in real-time. Upon activation and installation of the theme, you may want to begin with adding your profile picture. This is easily accomplished within the WordPress Customizer. Navigate to Appearance > Customize > Site Identity within the WordPress admin. Upload the profile picture within the Logo option. Scale the image using the Logo Size slider option. Note: It’s recommended that your image be a perfect square (i.e. 800px x 800px). As a result, the image will be cropped into a perfect circle rather than an oval. The Profile Lite theme supports WordPress header videos. However, header videos only display on the home page. So, a header image should be applied as well for display on the other pages. When adding a header video, you can either upload a video file to the Media Library, or display a video from a YouTube link. We recommend uploading your video to YouTube, and using the YouTube link to display the video. As a result, your video will typically load faster, and the file size will not be a drain on your server space. Navigate to Appearance > Customize > Header Media within the WordPress admin. Either Upload and Select a video from the Media Library, or Paste a link from YouTube. Click the Add new image button to replace the default Header Image. Note: In some cases, the header video may not appear in the Customizer exactly as it does on your site. So, check the live version of your site to make sure the video looks correct. One of the unique features of the Profile Lite theme is its display of social media links within a circular design around the profile image. 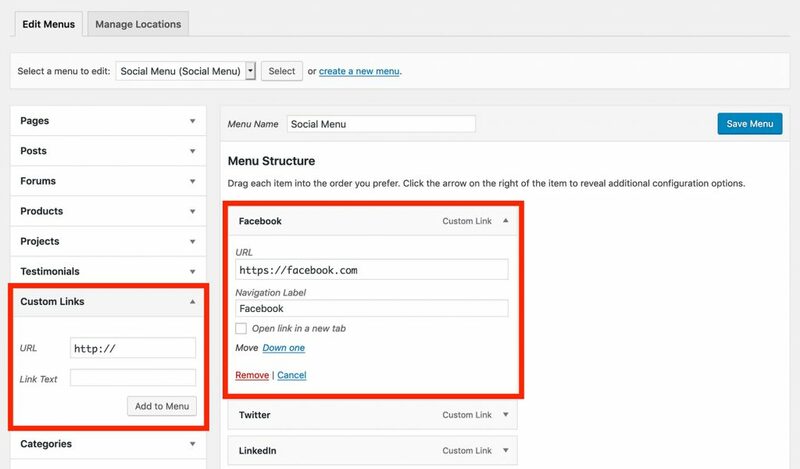 In order to setup your social media links, you will need to create a Custom Menu using Custom Links. If you’re unsure how to create a Custom Menu, please refer to our Custom Menus tutorial. There, we explain the process of creating social menus. Create a Custom Menu using Custom Links to social media profiles. Each Custom Link to a social media profile will automatically display the icon associated with the particular social media service. In the event the theme does not display an icon for your social media service, let us know so we can add the icon with an update. By default, Profile Lite will display your blog as the home page. However, you may want a page that’s more informational and dynamic. That’s where the Home Page Template and Organic Builder Widgets come in. Navigate to Pages > Add New within the WordPress admin. Add a Title to the page. Optionally add content to the page. Within the Page Attributes section, apply the “Home” page template. Navigate to Settings > Reading within the WordPress admin. For the homepage settings, choose the Static Page option. Select your newly created page as the Homepage. Now that your home page is setup, let’s take it a step further. 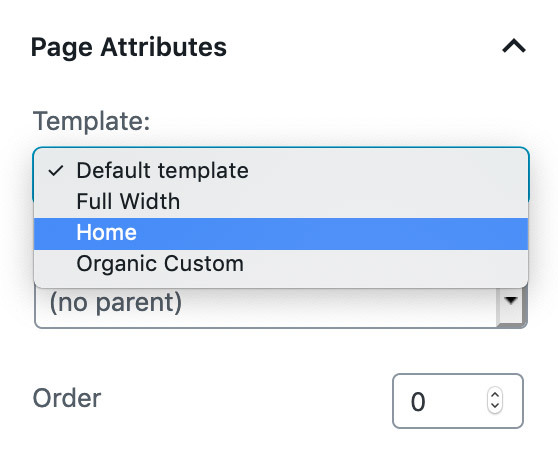 In this step, we’ll use Organic Builder Widgets to create dynamic sections on the home page. For the purposes of this tutorial, I will explain how to create a single testimonials section on the home page. However, you can use the same process to create other sections like content slideshows, portfolios, events, and much more. The free version includes 12 widgets with a variety of uses. Builder Widgets Pro includes 16 widgets, and many more options for the 12 free widgets — all for the low cost of $39/yr. It’s a simple and effective way to create dynamic pages directly within the Customizer. Navigate to Plugins > Add New within the WordPress admin. Search “Organic Builder Widgets” within the search field. After installation, click the blue Activate button. Okay, now let’s add your testimonials. You can accomplish this one of two ways — using regular posts or the testimonials custom post type provided by the Jetpack plugin. Navigate to Posts > Add New within the WordPress admin. For the Title, enter the name of your client. Within the body, add the testimonial content. Optionally, add a picture of the client as a Featured Image. Apply a Category named “Testimonials” to the post. Navigate to Testimonials > Add New within the WordPress admin. Enter the name of your client. Navigate to Appearance > Customize > Widgets > Home (Widgets) within the WordPress admin. Click the + Add a Widget button. From the list of widgets, choose the “Organic Testimonials” widget. Within the widget options, optionally add a Title and Content. If you’re not using Jetpack testimonials, select the “Testimonials” post Category. Optionally, add a Background Image or Color to the widget. Additional sections like portfolios, blog posts, slideshows and more can be added using a similar process with the other available Builder Widgets. You can learn more about using Builder Widgets by referring to our guide. That’s it! 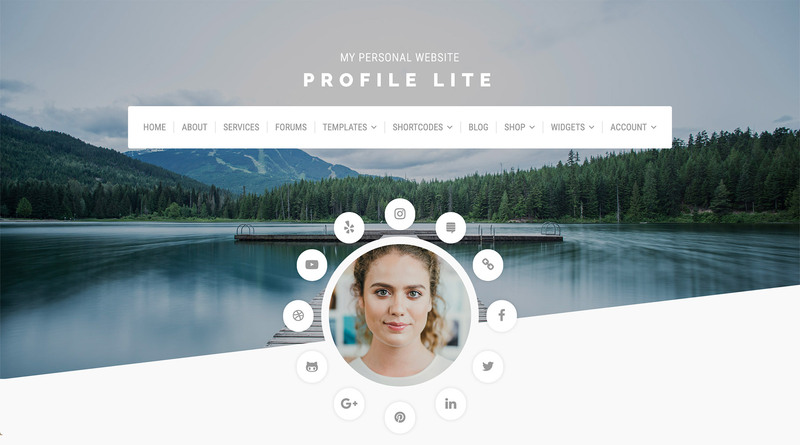 After completing the steps in this post, you should have a beautiful website showcasing your profile picture, social media connections, information about yourself, and a section of client testimonials. We hope you enjoy the Profile Lite theme. It’s all for you, and about you! Loving this theme for my page! I have run into an issue, however, with rich pin validation on Pinterest. It requires Yoast SEO plugin and metadata (which I’ve added for every blog post). Pinterest (AWS) can’t seem to pull the metadata from my page for some reason…would this have anything to do with the theme? A free theme with so many features. Love the design idea will really looking forward to use in one of my website. Thank you, I enjoyed your site. I love this but one thing is keeping me from loving it. Maybe someone knows what went wrong. I have my background photo set but instead of having that white section just below my profile photo where I can add some information about me, it opens back up to my background photo with my site title across it and then there is a place to put information. I want that second section with my background gone like what is pictured in the demo so I can just add my information. Does anyone know how I can do this?